Protocol Needed to Meet “in the Lord” as His Bride. The pictures in these articles are symbolic of some of the protocol (procedures for human behavior) needed to meet in the Lord as His Bride. It is a basic overview of the procedures for human behavior needed and it is all a learned thing. A meeting “in the Lord” is referred to as an “in Him” meeting. A ministry meeting is not like this but we do observe some of the protocol, especially silence in certain areas of the meeting. It has to do with respect and the holiness of the Lord. We also have a Round Table meeting after an “in Him” meeting. 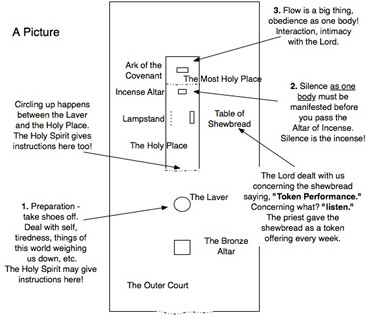 It is simply discussion of and bringing together the “things of the Spirit” revealed in the meeting and Flow Chart. And anything else the Lord shows us that needs to be done. 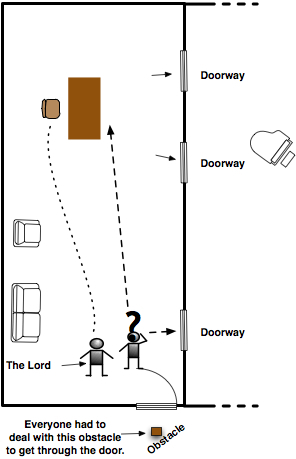 The Lord used the temple setting to give us understanding of how to enter into Him in a meeting. It’s not new; the High Priest entered into the Lord in the Holy of Holies. "Come to order, says the Lord. Come to order, as I will have order in My church. I am God, says the Lord, and I will have order to accomplish My purposes… . 1. We sit to wait on people to gather. One cannot straggle into the Lord, we enter as one person. Shoes come off in reverence to Him. When I tell you the ground is Holy, to take your shoes off, is it not to a greater cause? 2. Silence is the key, with a listening ear. “When I tell you it takes silence to enter into ME, is it not to a greater cause? 3. The watchman is the one here God appointed to get the agenda. The Lord said she was the eye. (More on this in other information.) If I held a Kingdom Meeting of a thousand and they all approached MY Throne at the same time would this not be chaos among the people? God is a God of order. I will have order to accomplish My purposes… . God dealt with us about a tight circle. It represents covenant and produces a closeness and a oneness. The tight circle is normally accomplished before you go past the Altar of Incense. Acts (taking shoes off, circling tight, silence) are important because faith without an act is dead. On 11-6-2009, the Lord had the corporate body do an act, a twist, as a single person while in a tight circle. On the twist HE said, “It takes the action.” So we can see that circling tight is an important symbolic act concerning being “one person” in the spirit realm. Be ready for anything. Things can change instantly in the course of a meeting “in Him.” Here is the picture given to us for understanding. 1. First we must pass by the obstacle pictured at the bottom of the picture (next page) to get into the meeting “in Him.” This obstacle was “in the way” and everyone had to deal with it to get in. It is the Altar of Incense, the silence that must be achieved to enter into the Lord. There are no exceptions! There were three entryways and I knew there were more odd shaped rooms (not pictured) behind those three entryways. They were all connected to each other by more entryways to be able to pass from room to room at the Lord’s leading. The Lord gives the room to start with and then reveals which room to go into from that room. Because they are all accessible from each other by entryways then there is no set order or pathway. The Lord does all the directing. Just follow Him and the transitions will be smooth for everyone, as long as there is no “self” involved. Respond to the Lord correctly in a meeting. It is a learned thing and don’t be upset at making a mistake, as the Lord said, “Don’t make a big deal about it….” Flow is very important - the River of Life is flowing through an “in Him” meeting and it doesn’t stop. 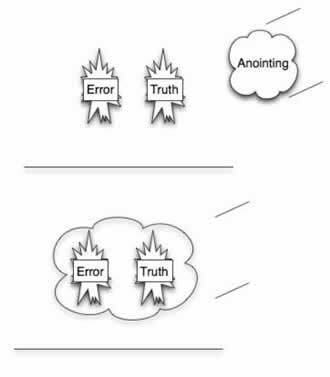 Errors after a truth don’t stop the anointing, but self (pride) will. Scene, I was in a room with a few people and a young woman who was bound was to my right. I began speaking about the fact that it can be hard to tell our spirits from the Holy Spirit because they are both spirits. I began to expound on being able to admit it, that it can be hard. At this point I saw the young girl, who was bound by pride, begin to become free. I don’t remember all I said in the scene right here, but I was sharing about moving forward in a meeting and how pride can keep people from learning. They won’t say anything because they might be found to have erred. Although I don’t remember exactly what all I said in the scene, the girl with pride was finally completely set free. She was smiling and I asked her if she was ready to go, motioning as if to get in the meeting (with us). She smiled and excitedly started across the room to get to where I had motioned. I was then focused on that part of the room and I saw truth and error suspended in the air, fairly close together, as if to be a flow or a sequence. That sequence of movement was from the right to the left. I then saw the anointing come in and surround both truth and error. Suddenly I knew the anointing would not come as it did if pride was involved. The key was not having pride involved in or disturbing the flow. The scene reveals that making errors will not keep the anointing from coming unless pride comes in. Flow in a meeting is very important because once you get out of the flow it is hard to get back in, if you can at all. Self/pride is fairly easy to recognize once you realize what it is. Other articles on the site reveal a lot about self. The “I’s” in our thoughts; “I want to speak, or I don’t want to speak,” when the Lord said He would tell us what to speak, when to speak it, are very revealing. Approaching the Throne when God said not to is “self,” which is pride. The Lord said, “You will hear Me when I want you to hear Me!” We are to listen and respond appropriately; it is a learned thing. The Lord brings up the subject/agenda, we don’t! I have been through many meetings where the Lord revealed nothing to me. This should not bother us and to be honest, it is a wonderful blessing to watch and be a part of the Lord working through other people. An “in Him” meeting occurs in the High Priest section of this symbolic picture.